The first question to ask yourself is whether a security offers an opportunity to make a profit. As statisticians say, you want to have a positive expectancy that a gain is possible. Not every security offers a profit potential. If it is range-trading sideways with low volatility, profit potential is low unless you know how to trade options. 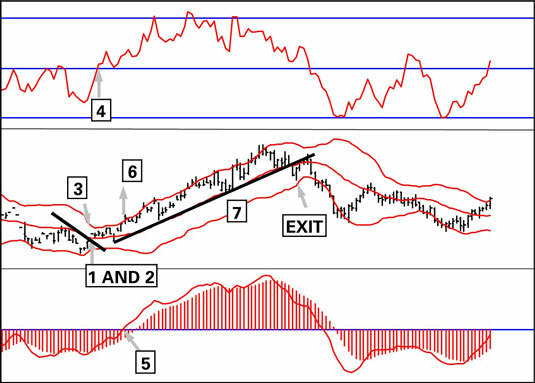 Think of the trade as a process in which the evidence mounts that the indicators are correct. Don’t neglect the configuration of the price bars themselves and obvious patterns. The price puts in three days of higher highs and higher lows, and then rises above a resistance line. The price gaps to the upside. At the same time, the price crosses above the 20-day simple moving average inside the Bollinger band. A few days later, the relative strength indicator in the top window crosses the buy/sell line to the upside. A few days later, the moving average convergence-divergence (MACD) in the bottom window crosses its buy/sell line to the upside, confirming the Relative Strength Index (RSI). Finally, the price breaks out above the Bollinger band top, a continuation signal that suggests the trend will keep going up. You can trade this chart any number of equally valid ways, depending on your appetite for risk. The probability of a trade generating a profit isn’t an objective number that you can determine scientifically at the start of a trade. You can estimate the chance of any particular trade being successful by subtracting the margin of error from the historical success rate from your backtests, assuming that you did a very large backtest. Developing a positive expectancy of gain by having your indicators pass successive tests is not the same thing as having found a “high probability trade.” There is no such thing as a high-probability trade. Trades can go wrong because of events that you cannot foresee or control. To speak of high-probability trades is to buy into the huckster and con man mindset. The only time to use the high-probability label is when you fix the stop and target at trade entry.